For over two decades beginning in the mid 1920s, the na me Frank J. Miller was synonymous with entertainment in Augusta. Through his company, Augusta Amusements, he and his partners owned and operated five downtown theaters. Mr. Miller was known around the country as one of the top entertainment promoters. In 1938, he commissioned famed Chicago architect Roy Benjamin to design a theater large enough to accommodate his growing audiences. The result was a beautiful Art Moderne style building that featured Italian marble terrazzo, black walnut millwork and a performance stage framed by fluted columns and tandem hand-painted panels. Named after its founder, the Miller Theater seated over 1600 patrons and was the second largest theater in Georgia, behind only Atlanta’s Fox Theatre. Today, it remains the only theater of this style in the state. 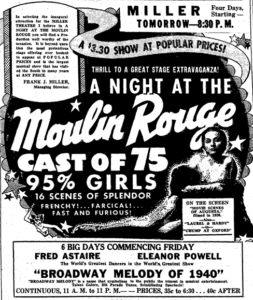 The Miller opened in February of 1940 to the sensational traveling show “A Night at the Moulin Rouge.” Dancers and singers traveled by train from New York City to thrill a sold-out audience. As a testament to the strength of Frank Miller’s vision, the Miller Theater remained one of Augusta’s top theaters for forty years, until finally closing in 1984. The theater sat in leaky disrepair until 2005, when Augusta businessman and philanthropist Peter Knox IV bought it with a mind to save it from ruin. A new roof was his first order of business and with the structure safe from water damage, he began considering alternatives for reopening the theater. In 2008, Mr. Knox offered the Miller Theater to Symphony Orchestra Augusta (SOA) as a performing venue and home. A formal study led a committee to retain a team of consultants for advising on the feasibility of renovating the theater to serve as a performing arts hall for the community and a home venue for the SOA. The committee engaged acoustical and theater design consultants to ensure that the theater could accommodate non-amplified music. Cost and operations consultants were hired to determine the financial requirements for the construction and ongoing operational requirements of the theater. 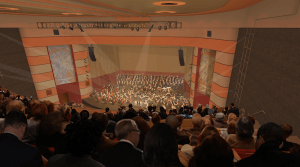 With the opinion in hand that the Miller could in fact be renovated to serve as a performance hall for Augusta and a home for the SOA, the Symphony Board of Directors voted unanimously in September 2011, to accept the gift of the Miller Theater from Mr. Knox. A capital campaign was launched, and in June 2016, thanks to the generosity of the community and many foundations, coupled with SPLOST funds and federal and state historic preservation tax credits, enough funding was in place to break ground. Set to reopen in late 2017, the Miller project will result in a 1300-seat historically significant downtown theater designed as the home of SOA and to host a variety of stage performances and artists. Acoustically, the theater will play well for non-amplified symphonic music, but it will also be equipped for rock-and-roll, jazz, film, dance and opera. The accompanying Knox Music Institute will house music education opportunities and rehearsal space.